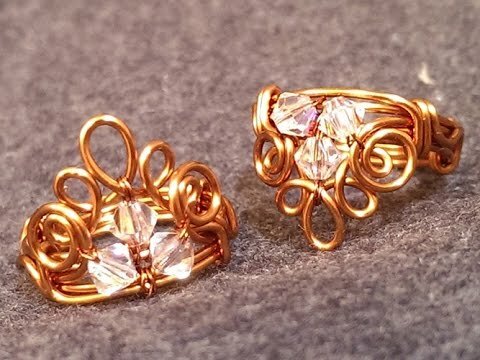 4 Wire Crown Ring Tutorials for the Princess in Your Life! Sometime ago, many of you were charmed with the Cinderella slipper and pumpkin coach wire wrapped pendant tutorials by Vietnamese wire artist, Lan Anh Handmade. Well, Cinderella became a princess so there must be a crown or two for her! The first 3 crown ring tutorials are by the same artist. I like this crystal tiara style very much along with the "crown jewels" a.k.a bicones ! Note that all the tutorials here are best suited to those with some wire experience. Wire artists do make it look very easy especially when they make loops and bends by eye! The next one is for a heart crown ring with wire weaving. The third one is perhaps more challenging especially the part where the upright loops are made. Practice is very likely needed! Christina of CSL Designs created the last one which is also an adjustable wire crown ring! Neat!